Creamy mousses, puddings, cakes and ice-creams! If you these words sadden you, then you are probably under the misconception that such desserts are a strict NO-NO for a heart-friendly meal. Have a look at these recipes before you decide. From kheer and phirni to pies and puddings, this section features luscious, heart-friendly desserts like Strawberry Yoghurt, Eggless Chocolate Pudding, etc., made using nutritious and low-fat ingredients - perfectly okay to enjoy as occasional treats. The desserts in this section are prepared using low-fat milk products, less sugar or no sugar at all. Fruits and dry fruits like dates are used for sweetening. Apricot Stew with Vanilla Custard is one of the best dessert treats a person with high cholesterol can have as it is low in cholesterol and fat. Give a try to this unique recipe of Stuffed Lychees which are sure to melt in your mouth and you won’t regret making it. Apple and Walnut Kheer gives a boost of omega 3 fats from walnuts and antioxidants from apple, although the recipe uses low fat milk it is thickened by oats. Oats and apple fibre are great for reducing cholesterol levels. Give a punch of dry fruits and walnuts to yourself with this recipe for Date Pancakes, it is naturally sweet due to dates and raisins and does not require addition of sugar. Apple Crumble is one of its kind recipe which has a distinct flavour of stewed apples and cinnamon, cinnamon is also good for heart and should be included in your regular diet. Sweet Potato Puranpoli is a healthy version of regular puranpoli as it is made without using extra ghee/oil which add on to the calories, it is also low in sodium. 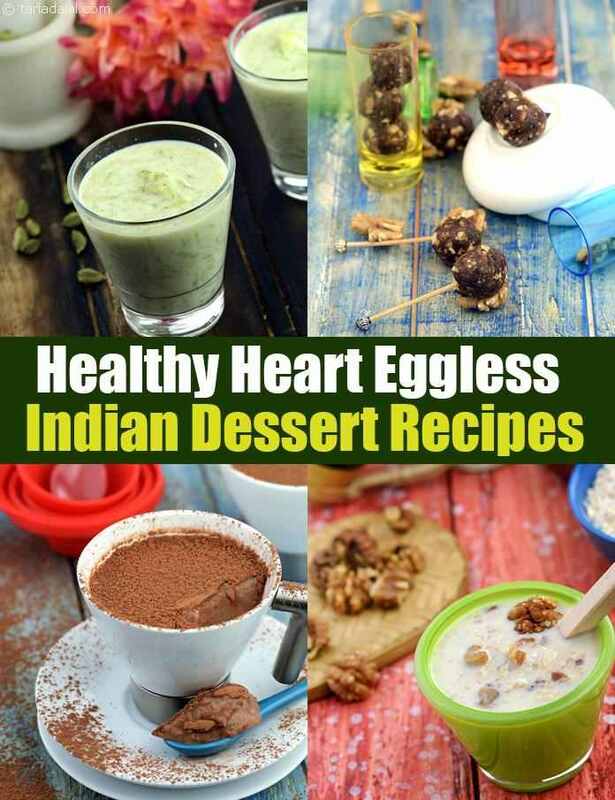 Enjoy our Heart Healthy Indian Desserts and other healthy heart recipes articles. A healthy version of the traditional calorie laden puranpolis. Sweet potatoes have been used instead of dal to minimize the sugar used. Cardamom powder, nutmeg and saffron add to the pleasing aroma of these low-fat puranpolis. Enjoy them with low fat milk instead of ghee for a sweet ending!